There are so many different types of flooring to choose from today. Despite this wide range of options, hardwood flooring is still considered to be the best because of its natural beauty, durability, strength, and ability to fit into any setting. Because there are so many different types of hardwoods to choose from, we at Sandy Springs Hardwood Flooring feel that it is our duty to explain the three main types of flooring that we will install in your home or business. Solid wood flooring is available in unfinished and pre-finished styles, depending on your preference in appearance. With unfinished wood flooring, we install the boards and then sand and refinish it on site. This option is best if you want a custom stain color for your home or business. 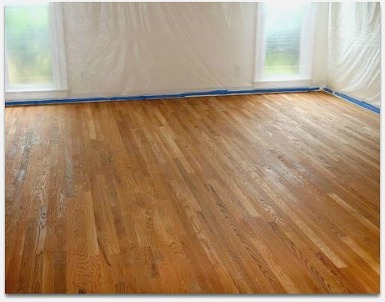 ​ Pre-finished wood flooring is already stained and finished and only needs installation to beautify your property. We offer solid wood strips that come in a particular width and varying thickness, plank flooring that comes in a particular thickness but varying widths, and parquet flooring which are made up of geometrical shapes that are pieced together using adhesive or fasteners. Solid wood flooring is the most expensive type of hardwood flooring material but is the longest lasting. It can be refinished over and over again depending on the thickness of the wood and because of the way it is installed, it is a permanent fixture in your home or business. With engineered hardwood flooring, layers of plastic laminate or plywood are covered with a real wood veneer. Because of the way engineered hardwood is manufactured, it is thick and sturdy and is less likely to be affected by moisture and humidity, making it a great option for kitchens, bathrooms, and basements that usually have high moisture content. ​ It is less expensive than solid wood flooring because the layers constructed of lower quality materials, but this does not mean that engineered wood flooring is of poor quality. The only downfall of engineered hardwood is that it can only be sanded and refinished a few times because the surface layer of real wood is a lot thinner than solid wood flooring. Engineered hardwood is also a lot easier to install and can be placed over existing floors, unlike solid wood flooring. Typically used in commercial properties, this type of flooring is very sturdy and highly resistant to scratches and moisture damage. 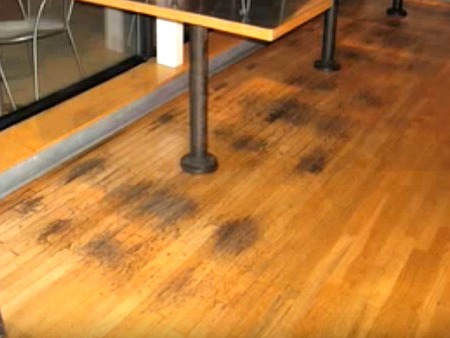 It is wood flooring infused with stain and sealant throughout the thickness of the wood, not just the surface. For areas with a high volume of foot traffic and potential damage, this type of flooring is ideal because it is so hard and less likely to show scratches or gouges. Solid wood flooring requires more upkeep than others, but can be sanded and refinished more often and will give you more value for your money if maintained correctly. If you like long, thin planks then you should choose strip flooring, go with plank flooring if you like very wide planks, or opt for parquet if you want something more decorative and interesting. Engineered hardwoods are very simple to install and usually only take a day to complete the whole process while solid wood flooring takes much longer. This is something to keep in mind especially in a commercial setting if you don’t want to interrupt your business. No matter what type of flooring you decide to go with, Sandy Springs Hardwood Flooring will ensure the preparation, installation, and clean up are all performed at the highest of standards. We can’t wait to hear from you so call us now (404) 341-7071!